The time to buy the insurers is typically during the eye of the storm as I wrote yesterday. 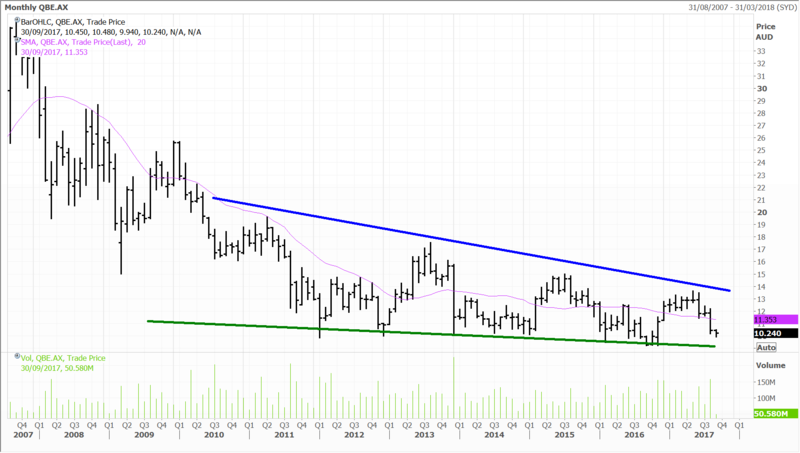 QBE Insurance rallied yesterday but it was muted, and we might see a better performance today. I wrote about QBE yesterday, and Greg Smith was on NZ radio this morning talking about the stock, and insurers generally. There has been much angst over the recent hurricanes (and associated losses) to hit the Caribbean and the US, which have been a ‘1 in 100’ year event, but a few aspects need to be taken into account. Firstly, (and without making light of the damage or loss of life) the close proximity of the storms has certainly been unusual, but the losses in total are not particularly extraordinary. Hurricane Harvey is believed to amount to around $60 billion in damages, while those forecast for Irma have been reduced significantly following its downgrade to a tropical storm. Irma loss estimates now appear to be (in a much reduced range) between $20 and $60 billion. So at the top end this is $120 billion for the two storms – by way of perspective, the total losses from the devastating Hurricane Katrina in 2005 were around $160 billion. The reality in any event is that large losses are a double edged sword for the industry, with a short term negative impact, but having the ultimate impact of taking out capacity and lifting catastrophe insurance rates over the medium to longer term. This could bode very well for well capitalised insurers (with capacity) such as QBE Insurance. QBE does have exposure to North America, but is well covered by reinsurance, meaning the near term losses from a once in a lifetime two pronged storm event may be only a few million dollars. 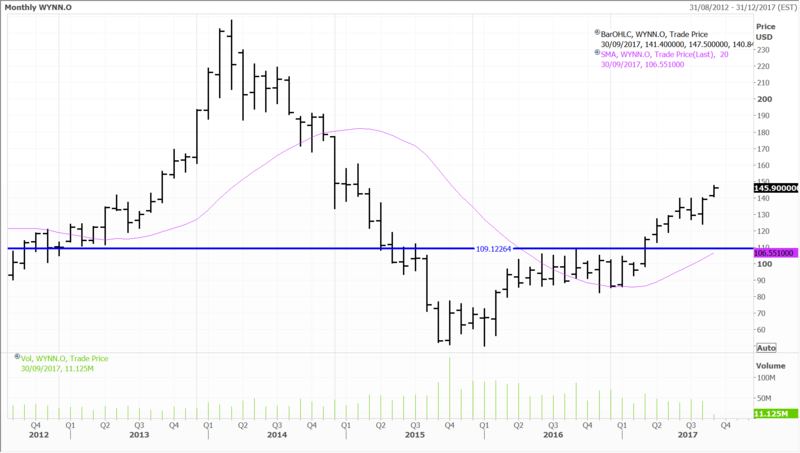 Therefore, QBE, while slightly higher yesterday, is significantly oversold in my view – bearing in mind also that the recent issues in Latin America relate to a division that is only 10% of total revenues. This could be a classic case of the “Boy who cried Wolf” with respect to the market that has become overly conditioned to earnings misses and profit downgrades over the past five years. What happens when QBE Insurance finally comes out with an earnings beat? I see a high probability of that day arriving soon. Wynn Macau was also stronger on Monday, rising 1.7%, with investors also buoyed by an initiative to improve the company’s debt profile. Wynn Macau is also one of our core holdings in the Fat Prophets Global Contrarian Fund, along with other Casino operators such MGM China and Sands China. Wynn Macau is looking to raise $1.35 billion through a long dated senior note launch. The funds will be used to redeem the equivalent amount of 5.35% notes due in 2021. Given the ongoing rebound in Macau, the appetite should be strong. It also has helped that second quarter results were also strong. Wynn Resorts reported net revenues of $1.53 billion, up around 44.5% year-on-year. 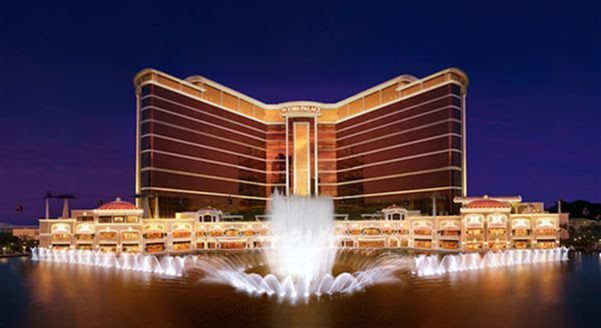 Wynn Palace (located in Macau) was the key contributor to the gain, chipping in $414.7 million. Positively, Wynn Macau (the company’s other property) also reported a year-on-year revenue increase of $43.4 million and the Las Vegas operations posted an increase of $12.9 million. It was a similar story at the earnings level, with group adjusted EBITDA of $430 million in 2Q17 marking a 37.5% year-on-year increase. Wynn Palace was responsible for contributing the lion’s share of the increase, with some $87.4 million of adjusted EBITDA. There was also an increase of $20.0 million from Wynn Macau and $9.9 million from Las Vegas. It was the third full quarter of operation for Wynn Palace and the ramp up thus far has been very encouraging, particularly in terms of ‘mass market’ turnover. Non-casino revenues from Wynn Palace were $42.4 million in the quarter, with strong room occupancy of 96.2%. There is also still plenty of scope for margins to improve, and this should play out as the property settles in and foot traffic increases in the future. The property also faces some impediment in the sense that it is still surrounded by construction. Bearing that in mind the performance has been solid and when in full swing, management believe Wynn Palace could generate as much as $250 million in property EBITDA per quarter, or about treble what it contributed in 2Q17. Wynn Resorts has a couple of expansion projects in the pipeline. The first is the water-themed ‘Paradise Park,’ adjacent to the company’s existing casino resort in Las Vegas. The first phase will require investment of around $400 million to $500 million and take a year or so for construction. Wynn is also building a $2 billion casino resort in Boston. The company broke ground in July 2016 and believes it will be a three-year project. We view Wynn’s Las Vegas and Macau operations as easily amongst the best in the industry, due to the high revenue and EBITDA they generate. This is a result of leveraging the strong brand, synonymous with luxury, to upper-middle and high-end customers. We see the long-term prospects for Macau tourism and gaming as strong, with a more ‘family friendly’ tone and entertainment options likely to pull in more punters. Infrastructure build out should support this, as it has done successfully in other aspects of China’s development. Wynn Resorts shares are trading on 13 times the average FY17 EV/EBITDA multiple, falling to 12 times the following year. This still looks reasonable given the growth on offer in our view. Disclosure: The Fat Prophets Contrarian Fund declares a holding in QBE, MGM China, Sands China, and Wynn Resorts.